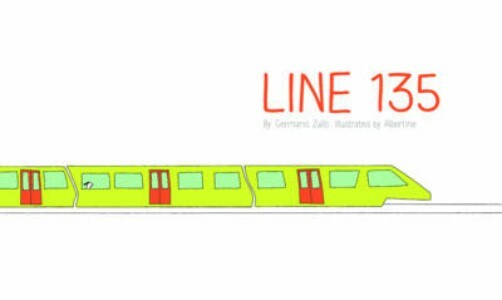 Line 135 is by Germano Zullo and Albertine, the European duo who brought us Little Bird, which is translated by Claudia Zoe Bedrick of Enchanted Lion Books. Line 135 begins, "There are two places I belong in the world. The first place I belong is my house in the city. The second place I belong is my grandmother's house in the country." Line 135 is as much a book about traveling and moving from one place to another as it is about how we choose to see the world, with the young narrator's wonderful outlook gradually influencing the geography around her as the train travels to its destination. The narrator tells us that one day she will travel in every direction and "know the entire world." She also tells us that her mother and grandmother say this is impossible, that she it too small to know the entire world. And that it is "difficult enough to know yourself." She tells us that she doesn't always understand her mother and grandmother, who tell her that she will understand things better when she is big and that when she is big her "life will pass very quickly." But, the narrator knows that when she is big she will "make sure life moves with me" and she will know the entire world. She will say to her mother and grandmother, "You see!" And she will tell them what they have forgotten, what she has always known, "It is possible."